Chest computed tomography (CT) scan is used as a valuable and precise diagnostic imaging tool for the noninvasive assessment of lungs, heart, and mediastinum diseases. The major disadvantage of this imaging is the radiation exposure to superficial organs (i.e., breasts in chest scan), which are not usually the target of examinations. The risk of cancer increases linearly with increasing dose, with higher risks for females, and exposures to young girls around the age of menarche and breast bud carry a high risk. As reported in the literature, bismuth is an appropriate in-plane shield for protecting superficial organs. The study of Kim et al. on the amount of breast dose reduction using bismuth shielding indicated that shield enabled a 16%–37.5% dose reduction in the breast, while it increased CT images' noise up to 40%. Tappouni and Mathers  assessed the effects of bismuth breast shield on dose and image quality. They showed that breast shield decreased dose to the anterior chest by 38% and caused a reduction in noise by a factor of 1.86 in the anterior compared to posterior regions. It should be mentioned that besides the effectiveness of a protective shield on dose reduction and not degrading the image quality, additional factors such as conformability, cost-effectiveness, weight factor, toxicity, and durability are important in selecting shields. In the past decades, several investigations have reported application of nano- and micro-polymer composite materials to attenuate high energy radiation. Because of their favorable properties, these materials have great potential to be used as radiation protective shields. Based on the mentioned points, for the first time, two different homemade composites of polyurethane and silicon with 5% of bismuth were constructed and their impacts on image quality and dose were investigated. To verify their effects on dose reduction due to the presence of bismuth composite shields, thermoluminescence dosimeters (TLDs) were inserted in breasts and dose values were measured without and with both shields. In this study, to construct bismuth composites, silicon and polyurethane were used as matrices for bismuth particles. Bismuth powder (metal beads with maximum sizes of 150 μm provided from Merck Group) was poured gently by a pipette on a silicon or polyurethane flat surface with a thickness of 1.1 mm and an area of 30 cm × 40 cm. These shields were left in the oven at 60°C and humidity of 90% for 10–15 days. This method gently and continuously dries the composite mixtures with no air bubbles. On exiting the oven, they were left for 1 day at room temperature (25°C) to adapt with the normal situations, and then, they were used for the experiments. To compare the shields, attenuation coefficient of each element of both bismuth composites was obtained from XCOM program, and then, total mass attenuation coefficients of composites in CT energy range (<120 kVp) were calculated by compiling a FORTRAN program. 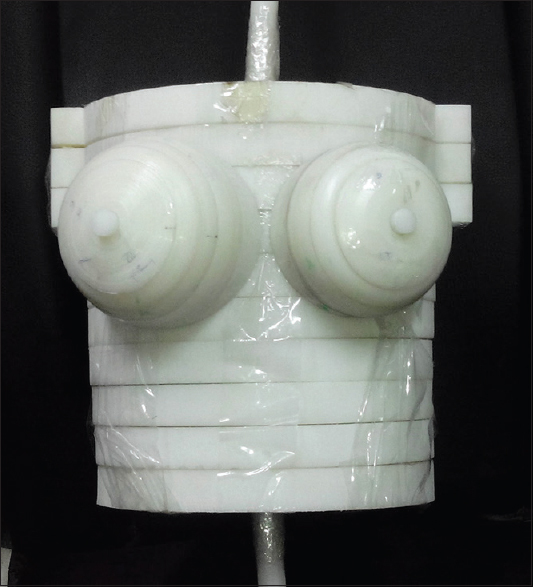 A physical chest phantom of a female was designed and built based on the recommendation of ICRP publication 23, ICRU report 48, and also the available anatomical data of lung and breasts in Tabriz University of Medical Sciences. The initial plan of the chest phantom was drawn using AutoCAD 2012. Based on the plan and by a waterjet cutter, phantom was cut into slices with thickness of 1 cm. Breasts and chest were made of polyethylene, and the lung was fabricated by cork. Two different breasts sizes were considered for female phantom to mimic different women physically and radiographically. [Figure 1] displays the designed physical female chest phantom with two different breasts sizes. The female phantom was placed in a supine posture at the isocenter of a Siemens Somatom Sensation 16 scanner. The conventional chest scanning parameters for adults considered by the machine automatically (tube voltage of 120 kVp, tube current of 80 mA, slice thickness of 10 mm, pitch of 1.3, and pixel size of 2 mm × 2 mm) were used for phantom imaging. The shields were placed on foam with thickness of 1 cm, and then, they were made to cover the anterior surface of the breasts. To avoid increasing the scan parameters after placing shields were placed after acquiring the CT topogram. To investigate the effects of shield on image quality, CT scans were performed without and with shields and the image quality was evaluated. Bismuth-silicon and bismuth-polyurethane composites were placed on small breast and big breast, respectively. The quantitative assessments of image quality include determining the differences between HU and noise of shielded and unshielded images. For this purpose, five circular regions of interest (ROIs) in the trunk and four ROIs in each breast, with area of 1.9 cm 2, were selected to measure both the average HU and the standard deviation (SD) in each region. The measures of SD can be used as a quantitative assess of noise within CT images, and collecting the average HU will check for variations caused by the presence of shields. ROIs were selected in the trunk and breast of phantom (in anterior, in lateral, in middle, and in posterior) on consecutive slices. Moreover, statistical analysis was performed using Statistical Package for the Social Sciences (SPSS) software developed by IBM Corporation and P < 0.05 was considered as the significance of the results. 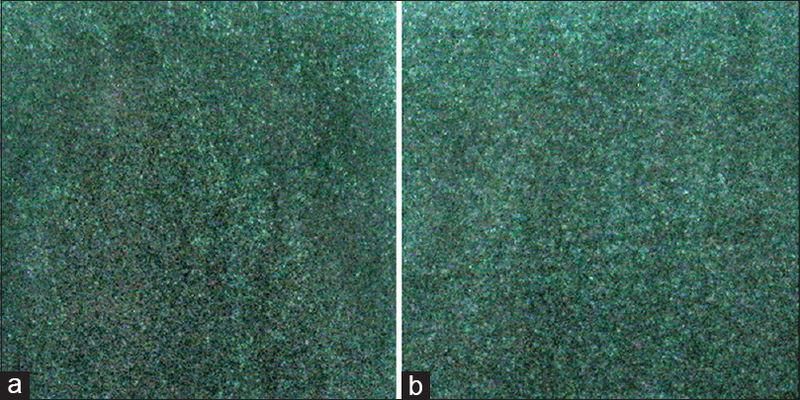 An initial assessment for the effects of these two composites on dose reduction was done using calibrated, energy-specific LiF: Mg, Cu, P (GR-200) TLDs (Hangzhou Freqcontrol Electronic Technology Ltd., China). They were placed inside the breasts of the phantom for irradiation without and with the presence of shield. Readout of the TLDs was done in a 7103 model Raman Security Development Co. TLD reader  during the temperature of 240°C for 10–20 s.
In [Figure 2], the radiographic images of bismuth-silicon and bismuth-polyurethane composites at tube voltage of 40 kV are represented. The bismuth beads are noticed on the surface of composites. For these two composites, [Figure 3] displays the total attenuation coefficients in cm −1. From figure, although two composites are similar in low energies, the attenuating property of polyurethane is more than silicon in higher energies. Considering the figure, for scans performed at lower tube voltages (i.e., 80 or 100 kVp instead of 120 kVp), these shields have more effects on beam attenuation and consequently their dose reduction rate might increase. 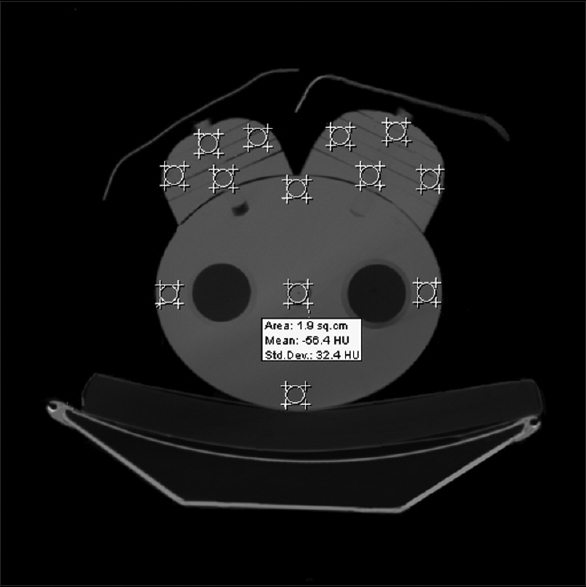 [Figure 4] displays the ROIs selected in all five slices of CT images. Each ROI identifies with a number. For the ROI located in the middle of chest, the circular area, mean HU, and standard deviation were measured. For these selected ROIs, the average value of HU, and noise without and with the presence of bismuth composite shields on the surface of phantom are tabulated in [Table 1]. From [Table 1], the HU values increased up to 4.5% and 1.8% for images shielded by polyurethane and silicon composites, respectively, while the increase in noises were 15.7% and 15.02%, respectively. The P values of the differences between HUs without and with shields were not statistically significant (P > 0.05). The outcomes of dosimetric measurements with TLDs using two shields showed 9.57% and 37.6%, dose reduction by bismuth-silicon and bismuth-polyurethane composites, respectively. In addition, it was reported that polymer-based shielding materials are lightweight and conformable, and they can be designed to include nontoxic, high Z materials that provide effective X-ray protection. In [Table 2], some of the investigations used conventional breast shields were tabulated. According to the outcomes, the relative differences between the average HUs of images without and with shield in 13 different ROIs were <4.5% for both shields. In addition, the maximum increase in noise was observed directly below the shields, which was 15.7% for polyurethane composite shield and 15.02% for silicon composite [Table 1]. Given [Table 2], most of the studies reported an increase in HU and noise. The results of this study confirm this as expected. It could be said that applying shields affects the values of HU because the effective energy of X-ray is changed and HU is directly dependent on energy. In addition, the increase in image noise is likely related to the beam hardening and scattering associated with the presence of shield. Considering the assessments of image quality, it seems that these two bismuth composites have no significant impact on HU and noise in the inner body and the maximum changes in these values relate to the breast, which locates directly below the shield. As long as the breast is not the target of imaging, these shields help reducing the high level of breast dose absorbed as the byproduct of its location. 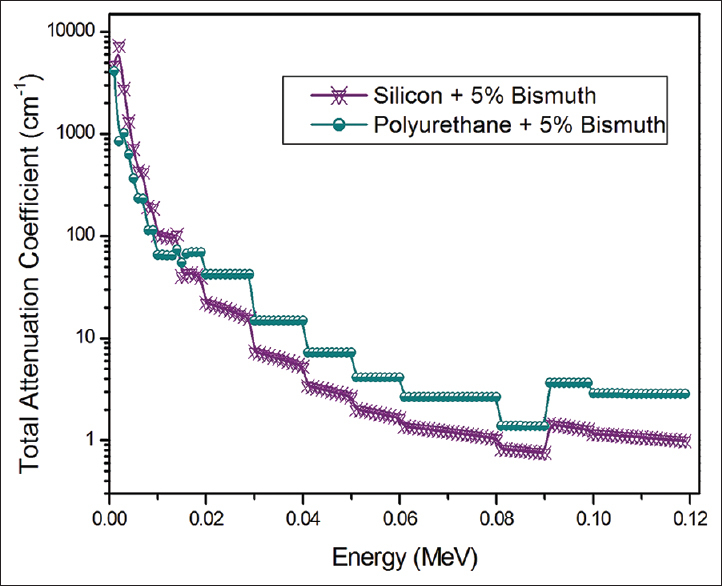 Comparing these two composites, the changes in HU and noise in bismuth-polyurethane composite are more than bismuth-silicon composite, but the differences are not statistically significant (P > 0.05). On the other hand, considering the amount of dose reduction, bismuth-polyurethane composite is more useful in dose reduction for diagnostic procedures, especially for higher tube voltages, which is expected from its attenuation property. Given the advantages of polymer composite over conventional materials for protective shields, two different bismuth composites were designed and fabricated. Polyurethane and silicon with 5% of bismuth were constructed as breast protective shield, and their effects on image quality and dose reduction in chest CT scan were investigated. According to the results, both composite shields reduce dose values and increase noises, which are most evident directly below the shield, but they do not cause distractions. However, breasts are not usually the target of CT imaging, so shields cannot interfere with diagnostic procedures. This work was supported by the office of the vice president as a novel and technical project for research at the Tabriz University of Medical Sciences in Iran. Hopper KD, King SH, Lobell ME, TenHave TR, Weaver JS. The breast: In-plane x-ray protection during diagnostic thoracic CT – Shielding with bismuth radioprotective garments. Radiology 1997;205:853-8. Parker MS, Kelleher NM, Hoots JA, Chung JK, Fatouros PP, Benedict SH, et al. Absorbed radiation dose of the female breast during diagnostic multidetector chest CT and dose reduction with a tungsten-antimony composite breast shield: Preliminary results. Clin Radiol 2008;63:278-88. Szajerski P, Zaborski M, Bem H, Baryn W, Kusiak E. Optimization of the heavy metal (Bi-W-Gd-Sb) concentrations in the elastomeric shields for computer tomography (CT). J Radioanal Nucl Chem 2014;300:385-91. Akhlaghi P, Hoseinian-Azghadi E, Miri-Hakimabad H, Rafat-Motavalli L. A Monte Carlo study on quantifying the amount of dose reduction by shielding the superficial organs of an Iranian 11-year-old boy. J Med Phys 2016;41:246-53. Geleijns J, Salvadó Artells M, Veldkamp WJ, López Tortosa M, Calzado Cantera A. Quantitative assessment of selective in-plane shielding of tissues in computed tomography through evaluation of absorbed dose and image quality. Eur Radiol 2006;16:2334-40. Halliburton SS, Abbara S, Chen MY, Gentry R, Mahesh M, Raff GL, et al. SCCT guidelines on radiation dose and dose-optimization strategies in cardiovascular CT. J Cardiovasc Comput Tomogr 2011;5:198-224. Kim YK, Sung YM, Choi JH, Kim EY, Kim HS. Reduced radiation exposure of the female breast during low-dose chest CT using organ-based tube current modulation and a bismuth shield: Comparison of image quality and radiation dose. AJR Am J Roentgenol 2013;200:537-44. Tappouni R, Mathers B. Scan quality and entrance skin dose in thoracic CT: A Comparison between bismuth breast shield and posteriorly centered partial CT scans. ISRN Radiol 2013;2013:457396. Korea Atomic Energy Research Institute. Nuclear Data Center. Available from: http://www.atom.kaeri.re.kr: 8080/cgi-bin/w3xcom. [Last accessed on 2018 Jan 23]. International Commission on Radiological Protection (ICRP). Report on the task group on reference man. ICRP Publication 23. Ann ICRP 1975;23:1-64. Mehnati P, Ghavami M, Heidari H. Reducing radiation doses in female breast and lung during CT examinations of thorax: A new technique in two scanners. J Biomed Phys Eng 2017;7:217-24. Raman Security Development Co. TLD Cards and Readers. Available from: http://www.rsdco.ir/proitem?item=tld-reader-model-7103. [Last accessed on 2017 Dec 01]. Mettler FA Jr., Wiest PW, Locken JA, Kelsey CA. CT scanning: Patterns of use and dose. J Radiol Prot 2000;20:353-9. Coursey C, Frush DP, Yoshizumi T, Toncheva G, Nguyen G, Greenberg SB, et al. Pediatric chest MDCT using tube current modulation: Effect on radiation dose with breast shielding. AJR Am J Roentgenol 2008;190:W54-61. Kalra MK, Dang P, Singh S, Saini S, Shepard JA. In-plane shielding for CT: Effect of off-centering, automatic exposure control and shield-to-surface distance. Korean J Radiol 2009;10:156-63. Catuzzo P, Aimonetto S, Fanelli G, Marchisio P, Meloni T, Mistretta L, et al. Dose reduction in multislice CT by means of bismuth shields: Results of in vivo measurements and computed evaluation. Radiol Med 2010;115:152-69. Wang J, Duan X, Christner JA, Leng S, Yu L, McCollough CH, et al. Radiation dose reduction to the breast in thoracic CT: Comparison of bismuth shielding, organ-based tube current modulation, and use of a globally decreased tube current. Med Phys 2011;38:6084-92. Geleijns J, Wang J, McCollough C. The use of breast shielding for dose reduction in pediatric CT: Arguments against the proposition. Pediatr Radiol 2010;40:1744-7. Einstein AJ, Elliston CD, Groves DW, Cheng B, Wolff SD, Pearson GD, et al. Effect of bismuth breast shielding on radiation dose and image quality in coronary CT angiography. J Nucl Cardiol 2012;19:100-8. Servaes S, Zhu X. The effects of bismuth breast shields in conjunction with automatic tube current modulation in CT imaging. Pediatr Radiol 2013;43:1287-94. Alonso TC, Mourão AP, Santana PC, da Silva TA. Assessment of breast absorbed doses during thoracic computed tomography scan to evaluate the effectiveness of bismuth shielding. Appl Radiat Isot 2016;117:55-7.